Photo: Jon Niola. Image License: CC. From the train, New Jersey looks strangely devastated, a marshy steppe swept through by invaders whose descendants are now bravely picking out a life in the ruins. The man in front of me explained to someone on the phone that he had left work early that day. He had a cough and I covered my mouth to not inhale the sick particles, but all he left me is a warm sense of having shared in his freedom from work, the dusk-tending afternoon a gift in a waged world. I’m a travelling salesperson of sorts, but my product is of no real use to anyone, i.e. I work in the proud uselessness of art. On paid-for trips to anonymous cities (anonymous to me), I check in to budget hotels or student accommodation and stay up late finishing my presentation or picking out which of my works I will share in an informal setting, where, after I have finished talking impassionedly and too fast about race/gender/capital/despair, some people will come up and speak to me, some people will politely ignore me, and sometimes a white woman will grab a handful of my hair. Sometimes a friendly host takes me out to dinner and sometimes I eat on my own in a restaurant I have found on Yelp. Sometimes I flick through a dating app and message some strangers, but I never meet them for the same reason that informs the work I’m there to talk about, which is that I suspect myself of being illegible to others. Because my work is art-making and writing, I am allowed, even encouraged, not to make my product (my self, my thoughts) easier for the consumer to understand but to dwell in its many complexities, both real (who knows) and imagined (who knows). In this way, I have found a gap in the market of the art/para-academic circuit, the perfect niche for an unthreateningly light-skinned black artist to come and induce mostly white audiences to feel a frisson of shame about their race, their gender, their class position, their accidental hostility to collective human life, etc. I do not believe this to be important work – life is elsewhere – but lately it has provided a living. On the trip to Princeton in early March, I had finally flourished into the full extent of my travelling-salespersona, as I was also carrying with me 15 copies of my book, which I hoped to sell after the reading I had been scheduled to give. Princeton is an attractive university town after the English colonial model. It scores about zero on a quantitative scale of blackness and approximately an 8 on a quantitative scale of prettiness. To get to Princeton, you get off the commuter train at Princeton Junction and you board an adorable little train that looks vintage, in the boutique sense rather than the usual US-infrastructural sense of being on the verge of collapse. This takes you one stop, to the heart of the university town. I went into the store next to the station to buy a banana and a pack of cheap New Jersey cigarettes. The young white man who had invited me came to meet me. We were strangers but we were both from England so we made small talk about that. We walked along the English-looking streets speaking in our English-sounding accents. Whenever I meet people from England, I am moved to express how much I hate England. I know this is not charming at all but I can’t help myself. I wondered if it was unprofessional to be eating a banana and if the man was disappointed by my appearance, if he found me not black enough or too black (there is a quantity theory of blackness), too pretty or not pretty enough (there is a quantity theory of prettiness). Princeton is an attractive university town after the English colonial model. It scores about zero on a quantitative scale of blackness and approximately an 8 on a quantitative scale of prettiness. Like the man who invited me, I attended the University of Cambridge, so I am familiar with the concept. This concept is that the children of the propertied rich plus a few scattered talents charitably drawn from the lower classes are gathered together to transition from childhood into adult life through a training in the importance of their opinions. The combination of this training, which was a class privilege, and my hostility to it, which was also a kind of privilege if I think about it carefully enough (a privileged underprivilege), helped get me wherever it is that I am today. I was allowed into one of the central institutions of the reproduction of the English ruling class, who are among the most evil people to ever walk the earth. These are the people who broke the relation between community and land that we now think of as indigeneity, and for centuries went around ruining the world under the sign of a ferocious paternalism, which insincerely theorized that it was better for people to be scattered, hurt, unfree or even dead than uncivilized. This ruling class is narcissistically obsessed with their own comfort and safety; another way to express this is that they are obsessed with accumulating wealth. Their classic phenotype resembles a chinless, lipless potato; of course not inherently, hopelessly ugly – anything can be redeemed by love – but certainly not immediately compelling, especially when it appears in the features of, say, the British prime minister David Cameron, an almost perfect example of this potato-type. Even the potato, their closest vegetable companion, does not geographically belong to this people; they must have been pleased to make its acquaintance in South America. But geographical belonging would never have become important if they had not made it so, through their invention of the modern concept of race. The young white man who invited me to Princeton recommended that, before leaving, I visit the art museum to view the colonial holdings in the basement. It was a sunny day; I stopped to drink a coffee in a café where there was one other visible person of color. The habit of counting is automatic and constant, but comes up to the level of consciousness in small towns, where I feel less sure of myself. In any case, when I travel, at least half of my attention is always on my phone, a magic object that promises protection from danger or boredom. 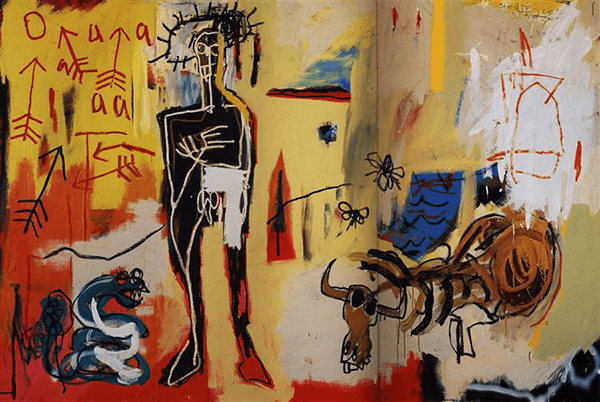 Poison Oasis, Jean-Michel Basquiat, 1981. Courtesy: the Princeton Art Museum. On the ground floor of the Princeton Art Museum there is a Basquiat painting called Poison Oasis. Immediately I felt I had come to Princeton to see this painting. A naked figure at the center of the canvas is flanked by a dead or dying horse and an aggressive snake. The little text next to the painting had some hard truths to transmit about what this meant for the condition of Basquiat’s soul, or the context his soul found itself in—a black man, New York, the world—but I can’t tell you what it said exactly, because I wasn’t allowed to take a picture. As I focused the camera on my phone, the guard stopped me. “They think of it as proprietary information, so I can’t even allow you to take a picture of the label,” she said, apologetically. “What a stupid policy,” I snapped, inexplicably on the verge of tears, and headed downstairs to the colonial holdings in the basement, which were just as egregious as I was promised. A chronologically mystifying collection of Chinese art included a glass case of contemporary photography right next to the sixth century temple decorations, as if, from the perspective of Princeton, “Chinese” is not only a geographic but also a temporal category, disrupting the customary progression of time. From this point of view, only artists of European descent can make contemporary art, or make art contemporary; everyone else is just helplessly expressing a culture. There were little tomb figurines from the culture of the Tuoba Xianbei, the animal faces just as, if not more, expressive than the human faces. I had vengeful fantasies of a basement gallery of “European art,” where medieval icons and branded plastic bags are installed next to Sarah Lucas sculptures, but probably that has already happened, without satire. Both the museum and the town itself were alien to the land they sat on, part of that cut between land and living imposed on the world by the Anglo ruling class and their allies. This annihilation of culture is, to an extent, the culture I grew up in, and certainly the culture in which I was educated in my formative years. I reject what I can of this, a perhaps meaningless rejection, a politics of gesture and feeling. I love WEB Dubois’ line about his PhD from Harvard, a supposed grace that he was the first Black man to receive: “The honor, I assure you, was Harvard’s.” These institutions are not honorable; they are soaked in blood. But, as Fred Moten and Stefano Harney have argued, there is an “undercommons” of the university, where many people try to do good work within an evil infrastructure, i.e. they try to point out the infrastructure’s evil. On the riptide of my hatreds, my ambivalence, my then-unplaceable anger, I sailed in and through Cambridge, and that is among the reasons that I am able to write these springy sentences for cash. I have no comforting words on this subject, except to note that too much political introspection, as with the treacly guilt of white allies who think the point of struggle is their moral perfection, can become boring navel-gazing. In Princeton, as at Cambridge many years ago, I conjured my ancestral ghosts, the illiterate shtetl Jews and field negroes and even the remote Irish peasants, and invited them to share my ambivalent pleasure in the dumb historical joke of my presence there.